Remember, never never NEVER run in front of a cannon. You will become very hole-y. Why Metallica for the music??? I don’t know. General Winfield Scott, commander of the U.S. Army, sent this letter to George McClellan during the earliest stages of the war. It was in reply to a letter from McClellan which set forth several proposals for the prosecution of the war. 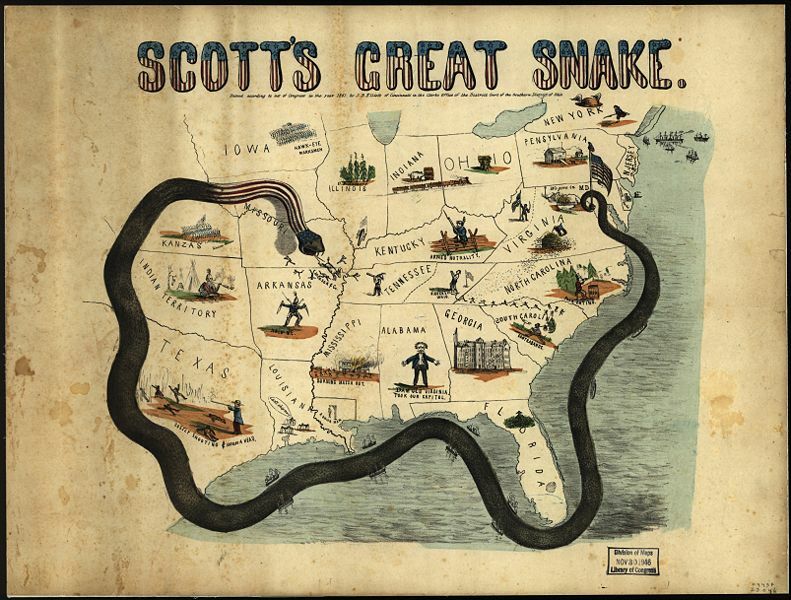 In this reply Scott gives his ideas on the subject, which were to become known as the Anaconda Plan. 1. summarize the major characteristics of the Anaconda Plan. 2. What does Scott say about giving the 90-day volunteers the best weaponry? Why would he say this? SIR: I have read and carefully considered your plan for a campaign, and now send you confidentially my own views, supported by certain facts of which you should be advised. First. It is the design of the Government to raise 25,000 additional regular troops, and 60,000 volunteers for three years. It will be inexpedient either to rely on the three-months’ volunteers for extensive operations or to put in their hands the best class of arms we have in store. The term of service would expire by the commencement of a regular campaign, and the arms not lost be returned mostly in a damaged condition. Hence I must strongly urge upon you to confine yourself strictly to the quota of three-months’ men called for by the War Department. Second. We rely greatly on the sure operation of a complete blockade of the Atlantic and Gulf ports soon to commence. In connection with such blockade we propose a powerful movement down the Mississippi to the ocean, with a cordon of posts at proper points, and the capture of Forts Jackson and Saint Philip; the object being to clear out and keep open this great line of communication in connection with the strict blockade of the seaboard, so as to envelop the insurgent States and bring them to terms with less bloodshed than by any other plan. I suppose there will be needed from twelve to twenty steam gun-boats, and a sufficient number of steam transports (say forty) to carry all the personnel (say 60,000 men) and material of the expedition; most of the gunboats to be in advance to open the way, and the remainder to follow and protect the rear of the expedition, &c. This army, in which it is not improbable you may be invited to take an important part, should be composed of our best regulars for the advance and of three-years’ volunteers, all well officered, and with four months and a half of instruction in camps prior to (say) November 10. In the progress down the river all the enemy’s batteries on its banks we of course would turn and capture, leaving a sufficient number of posts with complete garrisons to keep the river open behind the expedition. Finally, it will be necessary that New Orleans should be strongly occupied and securely held until the present difficulties are composed. Third. A word now as to the greatest obstacle in the way of this plan–the great danger now pressing upon us – the impatience of our patriotic and loyal Union friends. They will urge instant and vigorous action, regardless, I fear, of consequences – that is, unwilling to wait for the slow instruction of (say) twelve or fifteen camps, for the rise of rivers, and the return of frosts to kill the virus of malignant fevers below Memphis. I fear this; but impress right views, on every proper occasion, upon the brave men who are hastening to the support of their Government. Lose no time, while necessary preparations for the great expedition are in progress, in organizing, drilling, and disciplining your three-months’ men, many of whom, it is hoped, will be ultimately found enrolled under the call for three-years’ volunteers. Should an urgent and immediate occasion arise meantime for their services, they will be the more effective. I commend these views to your consideration, and shall be happy to hear the result. that that nation might live. we cannot hallow this ground. have dedicated it far above our poor power to add or detract.